One of the major differences between renting a home and owning one is that if anything goes seriously wrong, its all down to you. There will be no landlord paying for expensive boiler repairs, or no management company arranging for an emergency plumber to come and fix a leak. Youre on your own, and when disaster strikes – which it inevitably will – you need to be ready. But heres the thing – how can you prepare for the unexpected, particularly if you have no experience of these disasters happening before? Were going to explore a few ideas you can use right now, so read on to find out more. First of all, make sure that you are ready to deal with accidents in the home with a first aid kit – it can really make a big difference to when it comes to first response treatment. And the potential of a fire occurring at any point is a very real one – so invest in a few fire extinguishers, ensuring you know the difference between colours and uses – you need a different extinguisher for electrical fires, for example, than you do for your furniture going up in flames. Insurance is one of those incredibly dull and dubious things in life we all cant abide, but have to bite our tongues and get on with. But dont just pick the first policy you come across – take some time reading the small print and ensure that you have the right levels of cover. Its also important to check your policy every year or so to make sure you have enough cover. Whenever you make a new major purchase, renovate, or even buy a dog, your insurance needs to change. Another great way to ease the pain of a household breakage or disaster is to create an emergency fund. In an ideal world, it will be somewhere between 3-6 months of your current income levels, and it will allow you to pay for emergencies of breakages without impacting on your usual spending and saving. You may have to borrow money to make repairs on your home, but its important to ensure you choose a company that offers the best possible deal. Using quick loans is an option, of course, but only if you can guarantee you can pay it back as soon as possible. You might try applying for an interest-free credit card, too – so you can pay back the amount you borrow over 12-18 months and avoid any interest charges. Every community has small armies of tradespeople who offer electrical, building, repair and plumbing services. But lets be honest – in every community, there will always be some that are better than others. As a homeowner, you should be looking to find reputable, experienced tradespeople and firms that you trust, so when the time arises you can call them straight away to help out. Did you know that in the spring and summer months, house buyers pay a lot more attention to the state of the garden than they would in the winter? That means as a seller, you need to ensure that the outside areas are shipshape and Bristol fashion to close that sale. One way that you can do this is to have a water feature installed. But there are so many options out there, which one should you pick? Read on to find out. The first option that you have when installing a water feature is to go for something that is both Zen-like and neutral such as a babbling slab. These are usually made from pieces of rock like basalt with a hole drilled in the centre to allow the water to flow up and over the rock. They are a nice way of getting that babbling water sound in the garden without having a full pond, and they can be very relaxing. Just remember that you will need to plumb them in or use a solar pump to ensure that the water circulates properly. Now there are many types of ponds, and it’s best to pick one that is going to suit your property and garden. If you have a modern home, then you might want to go for a geometric sunken pond set directly into the patio. However, if you have a more old fashioned country style garden, then a more organic and quaint style and can work better. Of course, no matter what style you choose, you will need the right materials to construct and finish your pond such as pumps and filters. Also, dont forget that you can create a stunning pond with the range of pond paint that is now available. Which not only makes it more decorative but give your pond a watertight seal as well. Another great option for a water feature in your garden that can really help to sell a home is to install a cascade herb planter. This is a smaller water feature so is great for tighter spaces and works equally well in kitchen gardens too. The idea is that there are reservoirs of water that flow into one another, and around these, you can grow all sort of kitchen garden herbs for cooking. As you are trying to help folks imagine their lives at your property, little touches like this can really catch people’s eye and help seal the deal. Lastly, if you love the idea of a water feature in the garden but don’t want to be bothered by all of the effort and expense of installing one, why not go for a water bowl? These are large metal bowls that are used constructed of materials like steel or copper. You can place them on any flat surface in your garden like a deck or patio, and they provide an element of water without all of the hassle. Also, the mental is designed to rust, verdigris, and patina in response to the water and weather, so they even look better as they get older. The kitchen could be seen as the heart of a home. Its where you can socialise, cook food, and eat dinner together with guests and loved ones. Its the reason why many families that are looking for a property will always take extra time to scout the kitchen. Theyll make sure that every nook and cranny is explored and that the kitchen is absolutely spotless. In fact, many families consider the kitchen to be the deal breaker when buying a home. When renovating a home to sell, you could be in for a nasty surprise if you dont focus enough of your attention on the kitchen. In fact, last minute thoughts about your propertys kitchen might prevent you from selling a home altogether. Big families require big storage. If your kitchen doesnt have enough cupboards and cabinets to store all their stuff, then its a no-sale. You can add some additional storage by using drawer runners to create easy-access shelving and cupboard units. You could also consider an extra wall shelf or two. As long as your kitchen has ample amounts of storage, then youre guaranteed to score good marks with potential buyers. But a kitchen is no good if its in the dark. Make sure you have ample lighting to brighten up your kitchen. Utilise everything from multi-tiered ceiling lights, to wall lights, to lamps that can be used to save energy in the night. Mix coloured lighting with regular lighting and set up control boxes so that people who view your property can sample the different moods that coloured lighting can give the kitchen. Dont neglect windows either. Letting in lots of natural sunlight is a great way to improve the overall look of the kitchen. Make sure that your kitchen colours coordinate well with everything else in the kitchen. Dont neglect to match the kitchen colours to the rest of the house either. You dont want people to walk into a circus of different moods and colours with every room. There needs to be a colour plan that goes throughout the house, and your kitchen should be no exception. Paint the walls, the ceilings, use coloured lighting, and match appliances to the rest of the furniture. People dont want to walk into a bland and empty kitchen. You want to sell people their dreams, and their dreams are to use the kitchen! Set up plates (actual plates, not paper ones) on the tables, cutting boards, coffee tins, fill up the fridgedo everything to make the kitchen look livable and believable. Its a great way to give your potential buyers an idea of how much space theyll have in the kitchen. Buyers want to see shiny and sparkling surfaces on their kitchen appliances when they walk into your kitchen. They dont want to see dull surfaces and food stains. Make sure you give the kitchen a tech makeover and upgrade all the appliances. Everything from the stove to the microwave should be replaced. Itll add extra value to your kitchen, and prospective buyers will love you for the amount of work you put into it. Interior designers might have the best job in the world. They can see inside hundreds of different properties. And they have the creative vision to turn what they see into something spectacular. But you dont need to be an interior designer to make a few changes to your own home. If youre looking for some unique ideas that will get a buyers heart pumping, you could be spoiled for choice. Most of us hide rusty old radiators behind the sofa or cover them up altogether. The trouble is, we do need these unsightly beasts in the winter time. So why not swap out the grotty white thing blocking up your wall for something you actually want to look at? You could choose a tall Ultraheat radiator that takes up less width along the wall. Or maybe youre looking for something that is sleek and mirrored in the finish? Give each room in your house a wow factor with a wall-hung electric fire. LED surrounds give the room the kind of glow youve always wanted. If youre looking to create a period feel, why not restore an original fireplace? You can do this on your own by cleaning up a reclaimed mantel and hearth. You will need to book a chimney sweep to give you the all clear if you want to fire it up, though! Exquisite chandeliers in a contemporary style can work well in any room. There are even bathroom light fittings that can add that special something to the room. Decorative light switches can also look a lot better than a white plastic button on the wall. There are many bulbs to choose from, although LEDs tend to be the cheapest to run overall. Why not pick one that is app controlled? That way you can select the brightness and colour you want to illuminate your space. LED striplights are highly flexible and hugely versatile. They can be placed along the trim of your stairs, around the TV cabinet, or even along the corners of the walls. This can offer a brilliant lighting effect or a warm glow in any colour you choose. Many systems are remote controlled. You can buy them cheaply from your local DIY store. Bespoke storage ideas are wonderful to have in your home. These offer maximum use of space because they are designed exclusively for the room they are in. Of course, when youre looking for smart storage for smaller spaces, its best to seek out clever options. If you can clear every surface and free up the floor space, your home will look more spacious and less cluttered. This can be very attractive to potential buyers. Finding your own style is important. It doesnt have to be mainstream or part of a trend. But seeing that style through by working it from room to room can be very attractive to a potential buyer. Its sometimes best to pick a feature like a fireplace or a chandelier and design from there. What will inspire you in your home design today? Moving is a very stressful experience that takes a toll on everyone, even if you are quite used to it. When moving house or office goods, you have to deal with the responsibility of packing them, finding a way to transport them, and unpacking them when you reach your destination. This is a very huge task, which you might not be able to complete alone. In addition, several things can go wrong during the move, for example, forgetting some of your belongings or some of your items getting lost or damaged during transit. To prevent all these problems and ensure you have a smooth moving experience, it is important to hire a good removal company that will help you out with the move, thereby reduce the stress and hassles that are involved. When you are moving from London, you have the option of hiring a London based removal company, or one that is based in home counties and other areas outside of London. While hiring a London based company might seem like the best choice for most people – they are close to your location and have a lot of reputation – an out of the town removals company can prove to be a better idea. Below are the benefits of hiring a removals firm based outside London when moving. More expensive office space – London is one of the most expensive cities to rent an office, and the price of renting one keeps on rising as thedemand for offices increases. Therefore, London removals companies pay more for rent compared to those in other towns. However, in order to remain effective, they pass on the extra costs to customers by charging more for the services they offer. Higher insurance premiums – all removals firms are required to be insured so as to protect the customers’ goods during transit. When it comes to London-based companies, they are more likely to deal with London-based insurance firms, which will charge more for their services compared to companies located outside the city. Their insurance premiums are thus more expensive, and just like with the office rent, the costs will be passed on to the customers. Since out-of-town removal companies are based in locations where rent, insurance premiums, and other business expenses are cheaper compared to London, they are able to offer cheaper moving services to their customers. Therefore, you can get cheaper moving services with such a company, and still receive the same quality of service as you would have when using a London-based removals firm. London based companies serve a large customer base, and thus they will have several requests for relocation services at each given time. This means that when you hire such a company, you might have to wait for a few days, and in some cases weeks, before they are available to help you move. However, when it comes to out-of-town removal firms, their customer base is a bit smaller, which allows them to respond to your relocation request much faster. London removals companies based outside the city are also faster and more efficient when transporting your goods. Unlike most London-based firms that operate large moving trucks, they are usually small to mid-sized companies and own smaller trucks and moving vans. Therefore, when they are transporting your goods, you do not have to worry about sharing the track with another customer’s goods, and you can count on your items to reach your destination faster. Another advantage of hiring a removals company located outside London is because most of them offer some free services. Since they are usually small to mid-sized companies serving a smaller customer base, they try to gain more loyal customers by offering free services that include packing, unpacking, free quotes, and a free seat on the moving truck/van. This is a unique benefit that you cannot get when you hire London-based firms; they serve a larger customer base, and thus cannot afford to offer free services to all their clientele. In case you want some of these additional services when you hire a London-based firm, you might have to pay more, which will increase your moving costs. One of the reasons why some people prefer London-based companies when moving is because they are familiar with the London region, and thus can be faster and more efficient when navigating the city during transit. However, out-of-town firms have as much knowledge of London city, since they have probably helped lots of people move to and from there. In addition, they have more knowledge of the areas outside London, especially the local areas they operate in, compared to London-based firms. Their knowledge of these local areas is very important when relocating there, as they will easily navigate them and make the move faster. In addition to fast moving, easier navigation will also lead to less fuel usage, which will help to lower the moving costswhen moving in or around London. Another advantage of hiring an out-of-town London removals company is that they can provide you withstorage servicesfor some of the items that you cannot be able to move with. And since their storage facilities are located outside London, where rent and other expenses such as insurance and utilities are cheap, you can be able to acquire more affordable services than you would when using a London-based moving company. In addition, renting a storage facility outside London will be more convenient, as you can get one that is close to the location you are relocating to. This will make it easier and cheaper when the time comes for you to remove your goods from the facility. Moving from London can be quite a huge task, especially if it is a long distance move. It is for this reason that you should therefore hire the services of a reliable removals company, such asWynnes and othersthat are based outside of the big city, which can help you with the moving tasks, making the experience much easier and less stressful for you. We all want to add a bit of value to our homes, regardless of our situation. Whether you are selling, or just keen to plan ahead for a rainy day, its always a good idea. However, it can sometimes be a little confusing working out what the best method for adding value is. Which rooms should you start with? What should you do with them? Sometimes, it can be a little daunting getting started on home improvement projects. You might even wonder if it will be worth it at the end. However, done right, and done cleverly, they can be a great boost to your home value. Not only that, but improvements can add a little style or glamour to your home. If you are wondering what kind of improvements you should make, then read on. Lets have a look at the best options available to you. The garden is one of the best areas of the home for increasing face value. If you have a garden, this is where you should start your renovation project. Improving the garden doesnt have to be a huge task. Yet, it can make such a massive difference to the overall feel and look of the house. Consider installing a patio, if you dont already have one. These are extremely popular among new home buyers, and as such they tend to add considerable value to the home. Also, be sure to make the garden look beautiful in the traditional sense. Plant some perennial plants around the garden to add some colour to the place. Re-paint the shed, if you have one, and patch up any broken fencing. This makes a huge difference when it comes to selling. The next most popular room for renovation is the kitchen. Statistically, this is the first place that people want to renovate when they move into a new place. So it is a great idea to do it before they move in. You could potentially add a huge amount to the value of the house just by doing this. When you are choosing what style to have for your new kitchen, go for something fairly natural and plain. Plain colours are unlikely to offend anybodys tastes – and they are also easy to decorate over. Having a broad appeal is ultimately what gives your home its value. Everyone needs a functional kitchen, so ensure that any renovation bears in mind what the kitchen is used for! Maintain decent worktop space in order to achieve this. The only downside to renovating your kitchen is that it is one of the most expensive room to do so. However, shopping around for home improvement loans might enable you to carry through with your dream project. The bathroom is also very popular for renovation. Its not too hard to see why. The main reason is that people are usually quite concerned about hygiene. And, of course, with a new bathroom, you can be sure that it is still relatively clean. For that reason, consider this one of the main areas of focus – particularly if you are selling your house any time soon. 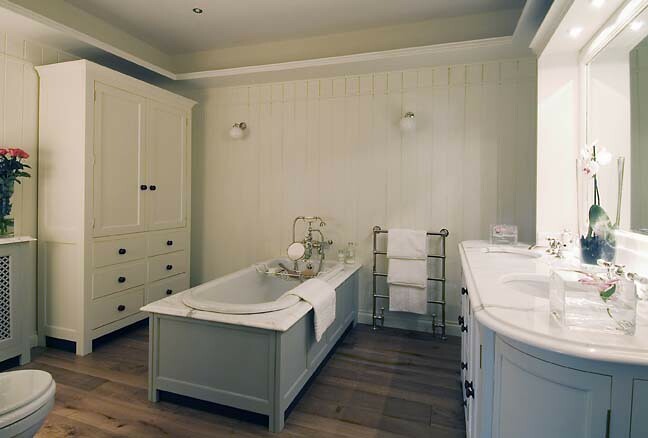 A renovated bathroom is a great way to add immediate value to a house, no matter how old the property itself is. One of the best ways to enhance your home is to build it from scratch. When you build your home, you know that you have the best possible property that you can afford. Otherwise, you end up spending a fortune on a house that needs a lot of work before it is livable. Still, building a house from the ground up isnt easy, and you are going to need to cover every base to achieve perfection. Before you can start building, you need a place to build. The problem is that you dont often come across spare pieces of land for sale in your local estate agents. In fact, you might not come across any land if you dont look in the right places. A great tool is the online resource Plotsearch. Just go to the site and browse for all the latest plots in your area. Another good tool is word of mouth. Someone within your circle will know a person that is looking to sell. All you have to do is keep your ear to the ground. Dont start building on any plot of land until you have the say so from the council. Even though it is your land, they can put a stop to your building work. And, they can tear down the building if you finish the work. Your neighbours and residents in the area can contest the building work as it can affect their lives. For instance, it might bring down the price of their house or cause them disruption. Contact the council and apply for permission. Once they give you the green light, you are ready to start. The last thing you want to do is to start building and then realise you dont have the materials to finish the job. Not only is it annoying, but it also takes up a lot of time. The best plan is to write down everything you think you need and go out and buy it. It is that simple sometimes. With firms like George Hill Timber merchants, you can find everything you need in one place. Or, you might prefer to buy from different suppliers depending on the cost. The key thing to remember is that you should plan ahead so that you can buy what you need. Money is probably the most important part of building your house because you cant get anywhere without money. If you cant finance the build, then you cant start building. To prevent this from happening, create a budget with all your expenses. That will give you a rough total of how much the process will cost. From there, you can start saving money or using alternative forms of finance to make sure you have enough. A good trick is to save more than you budget for because building works always come in over budget. No one wants to put the work on hold until they can find more money. You wont be able to build your property without a contractor. They are professionals that have a team of people at their disposal, and you are a novice. Even if you are a tradesperson, you cant do a job of this magnitude alone. Start looking for contractors that have a good reputation and a good track record. Look for these before anything else because this tells you whether you can trust them. After that, factor in the price as the cost of labour is going to be your biggest expense. Whoever you choose, dont let them dictate your designs. Their job is to build what you want, not the other way around. It is amazing how many people forget to find a new home during the building process. You shouldnt live there while the work is taking place because it affects the timeframe. Plus, you need running water and electricity to make it livable. Instead, live in a hotel or live with family or friends. If that isnt an option, buy a cheap caravan and put it in your garden. A caravan is also a good way to save money because hotels are expensive, especially if the work is going to take months. You will want to move in straight away, but you shouldnt cut corners in the process. You need to take your time and make sure you do everything properly. If you dont, you will have even bigger problems when you move in that will make your life hell. By all means find alternatives, but find legitimate alternatives. Enhancing the home is something we all want to as painlessly as possible. As well as looking great, were constantly working to add more use to our homes. We also keep in mind the value, and whether our current property benefits us financially as an investment. Investing in the home, for your own use and its value, is something you should always be doing. Even if youre running low on money. Its not impossible, or even difficult, to spruce your home up on a budget. Just get ready to put in some time and effort instead. Soon your home will be looking better than ever and your wallet wont hurt at all. When youre starting home renovations, its best to start with the very start. The entrance adds a lot of curb appeal and immediate value to the home. If youre thinking of selling, its important to have a great looking entrance to give the home that immediate wow factor. A dash of a greenery is a great way to keep things looking alive for minimal cost. An old styled but electric lantern can add a lovely warmth to it, too. At the same time, itll make sure youre not fumbling for your keys in the dark any more. One way to immediately freshen up the look of your home is to get the paints out. Your choice of colour can drastically change what kind of atmosphere it has. From comfy, warm dark shades to bright, vivacious splashes. Paintings also a great way to cover up any wear and tear thats happened over the years and replace faded wall dcor. You can use a colour scheme running through the whole home to keep everything connected, too. Lighting is incredibly important in the home. Replacing your fixtures doesnt have to be overly expensive, either. You can easily look for fixtures in old or contemporary styles on offer. How youre going to eliminate most of the costs in installing them is by skipping the electrician. Learn how to install your own light fixtures. That way youll be able to add that clear, bright lighting to any room without forking out loads of labour costs. Much like the lighting, the key to updating your furniture for cheap is learning how to do it yourself. Upcyclings a massive current trend in home fashion. If you have something thats looking a little worse for wear, repair it yourself. If a piece of furniture is faded or showing tears, use other fabrics and materials to replace them. Theres loads of great examples on the internet to search for. Just make sure you have the right tools on hand. Henkel hotmelt adhesives from Kenyon will soon be your best friend. Space is one of the most valuable commodities your home can have. Particularly when it comes to adding real monetary value onto it. People will always pay more for more space. But if you dont have the funds to add an expensive extension, what are you supposed to do? There are a few different solutions, depending on how drastic you want to get. For example, knocking down walls can be a great way to make a big spacious area in your house. Converting an attic or a garage can give you another usable room without so much of the demolition, too. Another key to adding space is having great storage. Most storage options are rather spacious and clunky in themselves. But you dont have to rely on big wardrobes and loads of drawers. Think out of the box and use other spaces. Some people use their walls and even their kitchen ceilings to hold all the more stuff. Others repurpose other furniture. For example, you can build drawers into the side of a bed, or add hooks to the insides of cupboards, giving them even more capacity. One of the more specific additions that can be made to a home without too much financial costs is crown moulding. There are different types of crown moulding but it cant be denied they add an aesthetic class to the regular, bare ceilings in most homes. Nor are they too difficult to install yourself. Learn how to fit crown moulding to add instant value to the homes ceilings. If youre handy with carpentry, you can even go as far as making them yourself. One of the parts of a home thats subject to most wear and tear is the floor. Years of sustaining people walking and dragging stuff all over them can leave them very unsightly. But replacing floors has always been a costly and involved process. Wooden flooring is better at lasting longer than the average carpet, but also tend to be more expensive. For replacing floors, the solution may be in laminate for kitchens as well as low budget hardwood floors. A big part of refurbishing any home and adding value lies in the bathroom. Its one of those rooms that can sell a home or doom it to remaining unsold for a long time. You can buy inexpensive, nice taps easily, but what about installing them? So long as youre careful, it doesnt have to cost you a lot to hire out someone to renovate your taps. Instead, you can just as easily do it yourself. Just do your research on plumbing so you dont end up with one severely water damaged house. Weve already covered part of the curb appeal when looking at your entrance. But one of the places that seems to be the most effort tackle can also add the most appeal and value to your home. Gardens are notoriously hard work, but that doesnt mean they have to be a great strain on your wallet. Get into DIY outdoor dcor and you can have a fantastic looking garden without having to pay a bomb for landscapers or expensive furniture. Does your home have unlocked potential? Are you eager to maximise your living space and add value without spending a fortune? These simple steps will enable you to bring about a stunning transformation on a budget. If your ground floor space is divided into smaller rooms, consider knocking down some walls to open up your living area. Arrange for some builders to have a look and provide some quotes. Look for inspiration online to give you ideas of what you could achieve once the heavy labour is completed. If its a straightforward job, you could add a lot of money without spending much. Open plan living is very popular, especially if you are targeting the family market. If you have limited space inside and a giant garden, it may be wise to think about extending or creating a garden room. Adding an orangery or conservatory gives you additional reception space and an attractive focal point in the garden. A Prior Conservatories DIY conservatory is an affordable option for those looking to save time and money. Match the style of the conservatory to your interiors to create a seamless flow from the front door to the back garden. If you have a little more money available, and youre looking to add value to your home in the long-run, you could convert a loft or cellar. Conversions are likely to cost thousands of pounds, but they add significant value. If youre running out of space and you love your current home, an extra room could also eliminate the need to move house. The cost of work will vary according to the size and condition of the space. Its always best to shop around, rather than going for the first quote. You could also get in touch with local agents to get an idea of how much value a renovation would add if you do decide to sell. Loft conversions could create an extra bedroom with an en-suite. A basement makeover may provide you with a large family kitchen-diner or a games room. A lack of storage is one of the biggest bugbears for potential buyers and homeowners. Investing in innovative storage solutions enables you to make the most of the space you have available. You can also enjoy the luxury of living in clutter-free bliss. Examples include fold-away shelving units and pull-out drawers and racks. If you already have off-road parking and you dont use your garage, turn it into an extra reception room. Redundant garage space could become a useful room, which gives you more space and makes your home more valuable. You could use the extra room as a study, a playroom or a snug. Whether youre selling up, or youre looking for ways to create more space in your home, these tips may prove useful. Before you carry out any work, get some prices and work out a budget. Add a contingency supply, just in case costs increase and enjoy a bigger, brighter home for spring. Building and renovations can be one of the most exciting aspects of property ownership. Renovations give you the opportunity to give a home character beyond its original specification. Or perhaps you intend to restore a place to its former glory. If you are expecting tenants, renovations are your opportunity to address any problems in the home itself. You can ensure the place is comfortable and reliable before any moves in. If the renovations are to your own property, they are an opportunity to finally make your mark on a home. It may have taken many months or years of earnings to acquire. However, there are a few key questions that it is essential to ask yourself before beginning work. A realistic, worst case scenario style budget is always advisable. Renovation can be intended to create new features and correct problems. But there is also a real possibility that it will expose problems you didnt know your property had. If a damp condition was discovered or issues with the foundations, could your budget stretch to it if work was urgent? With the most detailing planning it the world, unforeseen circumstances can still arise. Unless we have the budget to address then we must consider carefully whether it is wise to start. Investigating all your financial options and means of support is key. Have you consider loans or sponsorship, for example? You may be eligible for financial help if your building and circumstances qualify for it. Which equity release plan is right for you? Perhaps you can untie some funds located in a property you already own. However you achieve it, a good level of financial leeway is essential before beginning work. 2) Do I Have Permission? 3) Have I Done My Research? When were passionate about property, we may feel that most of our free time is engaged in research in some way! However experienced we are though, it is always important to check and doublecheck our information. A good rule of thumb is that details and comparative data should not be older than three months. Even if it means setting our project back by a few weeks or months, we should be confident that our information and research are watertight. Having missed a detail in a contract, or stumbling upon a far better deal because we rushed into a contract, for example, can be devastating. Ensure that you have made full use of all your sources. Not only have you checked examples online and in magazines, for example. You have also asked family, friends, and colleagues for their opinions and experiences. Instead of simply asking for a quote online, for example, make the effort to go in and discuss the finer details. Shop around and tell competitors honestly who is offering the better deal. By keeping your options open and ensuring that others compete for your business, you are more likely to find great deals. This may have been the very first question you asked yourself before considering renovations! It can be exciting to undertake a new project and begin researching. It can also be tempting if we feel that renovations and tweaks will significantly increase our profit in renting or selling. However, we need to be aware of the realities of beginning and ruthless about whether it is worth it. Even a job that seems simple on face value can reveal (or create) further complications. Do we have the time and budget to face this? Properties we own may also not be in the area that we actually want to settle. Consider whether it is worth investing in them long term. If we dont see ourselves in the area in the future, personally or professionally, then it may not be worth embarking. If a house is of a liveable, attractive standard then it may be better to reserve full scale renovations to an area we are likely to be long term. Finding and keeping the right tenants is essential to the success of any rental property investment. Tenants with kids are some of the most stable, some of the most long term and some of the best tenants to have sticking around. And to those kids, Christmas is magic. It’s a unique time of year that too many of us older folks have forgotten and, doing your job right just means remembering some of that. Even with families and kids as tenant, the holidays are also the perfect time to seal relationships with tenants, and to make sure they’re happy, even with a slight rent increase when the time comes. These are the ten most important things when it comes to celebrating, and doing it right, for landlord tenant relationships and for the overall success of your enterprise, no matter how small. 1. Put it in writing. Distribute your policy as to decorations, parties, revelry and electricity use early. Almost everything below should go into that policy. Mid October is a good time to have it distributed, because later on, you should really only be sending a card. The same list could be included at the time of lease signing, but it’s good to have a friendly reminder as the holidays approach, and as in general, people are often more receptive at this time of year too. 2. Decorations – So long as decorations aren’t being affixed to the building, most landlords aren’t going to get too involved. A policy about nails or similar fasteners might drive the message home. A word about safety especially with window curtains, electrical currents, potential overloaded outlets and ladders isn’t going to hurt. Of course, there are rare situations where tenants might go a little over the top, and in those cases it’s best to simply discuss decorating with them in person. 3. Common Areas – Obviously this depends on the type of units you’re renting, but a clear policy usually excludes the use of common or outdoor electrical outlets. In these cases, providing your own decorations, whether they’re electrical or not, in those areas won’t hurt and makes the impact a lot easier. 4. Electrical Safety – Again, for some tenants, you may want to forbid the use of electrical connections from inside to light outdoor lights. Most tenants are not going to feel very strongly about it. 5. Candles – This one bears repeating simply because the candles seem to come out for the holidays. They pose a serious fire hazard and there’s nothing wrong with using candles as an excuse to remind tenants to check smoke detectors and similar fire safety devices. 6. Revelry – For many property managers, leading up to the Christmas season is the only time they’ll remind tenants about noise, entertaining and showing guests out late at night. It’s ok to remind them at the same time that this policy is true year-round. Many guests won’t even know that such a policy exists and there’s no better time to remind them. Many tenants will actually be thankful to know that their own neighbors aren’t going to be throwing the real barn-stormers next door. A simple, friendly list of dos and don’ts is fine, and most tenants will read such notices, and remember even come graduation time next June. 7. Invitations – Some tenants will travel during the holidays. Invite them to let you know and get a chance to make upgrades, inspections, or retro-fittings while they’re gone. Replacing or upgrading appliances to newer more efficient models is a great way to welcome them back. In the event any unit will be unoccupied for long, you may want to discuss other issues with your tenants prior to their departure. 8. Insurance – Review your policies. Liability and property insurance can specify very different things for guests, or non-residents, and again, for units left unoccupied. Many landlords will review insurance coverage annually, and during December. 9. Burglaries – Burglaries and break-ins always go up around the holidays. It’s another good idea to remind tenants of this, and provide them with good contact information if repairs to windows or locks are necessary. A note reminding them to inform you as to when and for how long they might be traveling is also a good idea. 10. Generosity – Every landlord is a Scrooge, and that’s doubly true at Christmas. Though the media is filled with stories of ultra-generous and even newsworthy acts, even very simple acts will win hearts and minds, and again, especially during the holiday season. For landlords particularly interested in keeping good tenants in place, this is a good time to do it. Remember, too; holding onto better tenants isn’t an art so much as it’s just good business. It’s nearly always less expensive to renew a lease than to find someone to sign a new one. Christmas or whatever holiday your tenants are celebrating is a good time to get to know what they might like, or what might make them happier. Responding to requests like that will get you far better tenants than all the classified ads and internet postings in the world. Many of us consider the value of our properties before we take on major renovations or improvements to our home. We need to know that the value of the house after the works will exceed the cost of completing the project. It can be a challenge to figure out what buyers are looking for sometimes. But one area of the home that does make a difference to the value of your property is the exterior. It’s the first picture buyers see in the estate agent’s window. The front of your house must look attractive to appeal to serious buyers. Keep the facade clean and fresh. If it is rendered, a lick of paint could make a lot of difference. Repointing any damaged brickworks is also a good idea. Have a look at the front door. Is it fresh and appealing, or tired and lacking in security? Get the porch light working, and the path free of debris. Next, look at the planting and lawn. If your home looks like it’s drowning in the shrubbery, it’s time to trim it right back. You want to give the illusion that there is a substantial frontage. This helps make your house look grander and larger than perhaps it is. If the lawn is in a sorry state, consider replacing it with fresh stuff, or even using a high-quality artificial lawn. This applies at the rear of your property too. Your back garden is the main area people will be using to entertain in the summer. This means it needs to be fit for purpose. Tame any trees and planting that has started to overgrow. Make sure it is all well back from the property or controlled with freshly painted trellis. Check all the boundaries are enclosed securely, and paint the fences. All paths should lead somewhere and be free of debris. Your outdoor dining area should be staged. Invest in good quality Rattan garden furniture. It looks stylish and substantial to give the impression of a good sized area. The patio should be washed clean, or think about installing some decking. Decking can also be used to replace tired paving. Add a gazebo for shade and solar powered lighting to illuminate key areas of your garden. If you have any garden buildings such as a shed or garage, be sure these are tidy and freshly painted. They should also be secure if they are to be included in a sale. Lights on the exterior can help with this. Try to keep your garden in sections. There should ideally be a lawn or play area for children if you own a family home. You might have an area for planting. The dining area should be easily accessible from the main dining or living area of the house. Consider patio or bi-folding doors to help link the indoors and outdoors of your home. A well manicured and landscaped garden can add value to your home. These things take hard work and money, so they are attractive benefits for any potential buyer. Don’t forget the front is as important as the back. You need that kerb appeal! Making your home feel comfortable is most people’s top priority. Keeping your home warm, particularly over the winter months is one of the best ways to do this. Nobody wants to come back from a brisk winter walk to somewhere that is colder on the inside than it is one the outside. Heating is a necessity. Our lives are always made more difficult when we don’t have an efficient source of heating in our homes. A warm home is a happy home after all. Allowing your home to become cold and damp can cause havoc with your appliances and can damage the structure of your house. To ensure you have the warmest home this winter, here are some home improvement ideas you should consider investing in. If you feel that your current heating system is not quite up to scratch, then it may be time to replace it. Replacing your boiler is not only a great way of enhancing the efficiency of your heating, but it can also save you money on your energy bills. To help you make this decision, you can check the effectiveness of your boiler online. You will most likely need to take some details from the body of your boiler to fill in the relevant fields. You should now be able to determine the financial savings you should accumulate from installing a new boiler. These can be quite complicated calculations to ask for help from your energy provider if needs be. Also, consider how much you pay each year for the general maintenance of your boiler. If it breaks down often, you could be putting your money to better use with a newer model. Some boiler installments are covered by government grants, so find out if you are eligible. Also, look at alternatives to central heating such as fires and wood stoves. Wood stoves, in particular, are a great way of keeping your home heated. Installing a wood stove will require some hard work and planning, but it is more energy efficient and will reduce the cost of rising energy bills. As an added bonus, they also make a great focal point with their pleasing aesthetics. It doesn’t matter if you have a large or small home; there are wood stoves capable of circulating warm air throughout. When shopping for a wood stove always ensure they have a suitable fan device such as the Valiant Ventum 3. Without the fan, the stove can only heat the area around itself. If you are thinking of selling your home in the future, they also provide a unique selling point to potential buyers. Cold draughts can ruin the temperature in a room instantly. Fifteen percent of heat loss in the average home is down to draughts. Draught free homes are more comfortable at lower temperatures, so you don’t have to use as much heating energy. Eliminate current and potential areas where draughts can enter your home. Doors and windows that lead outside are the most common areas that draughts get in. Go through every room in your home and look for any holes, gaps or cracks. Pay particular attention to windows and doors. The gaps need to be filled or blocked to keep the heat inside and stop cold air getting in. You may need to hire professionals to draught-proof your home for you, or if you are confident enough you can do it yourself. If you decide to do it alone, make sure the draught-proofing materials that you buy are of a high standard and quality. You need to look for products that, when installed and maintained properly can last for up to twenty years. For windows, you will need metal or plastic strips to seal gaps around between the window and the frame. Foam strips are cheaper but are less likely to stand the test of time. Make sure they are cut the correct size to ensure effectiveness. You can also use these strips around your door frames. There are also some additional improvements you can do make to your doors more draught- proof. Install a brush or hinged draught excluder to stop cold air coming through the gap at the bottom of your door. Also ensure your letterbox is the correct size and cover your key holes with metal discs. Even covering the smallest of gaps can make a huge difference. Remember to not block or seal any sources of ventilation such as wall vents or extractor fans. We do need some airflow to keep our homes healthy and dry so doing this can be detrimental. Two of the biggest home improvements you can make is to properly insulate your loft and wall cavities. It’s easy to forget about these areas as they are often hidden from view. Unless you have recently had some installed, it’s likely that your current insulation is out of date and not up to current standards. It’s an easy thing to rectify as you can add additional insulation on top of what you already have. You can lose up to twenty-five percent of your heat through the roof of your home. Efficient loft insulation will trap this heat inside making your home more energy efficient. You can do this job yourself with some careful planning and the appropriate materials. Cavity wall insulations acts the same way as loft insulation. You will need to hire trained technicians to complete this kind of home improvement. The insulation is injected through small holes that are drilled into your walls. This will obviously be a difficult task to do by yourself and should always be carried out by professionals. Both of these insulation techniques are guaranteed to save you money off your fuel bills. It will make your home cosier in no time, and you’ll be glad you did it. So there you have it. You should now know exactly what you need to improve on to make your home warmer this winter. Plan ahead and get your home prepared for the unpredictable winter weather. Remember to research for schemes from the government, that you may be eligible for, to make heating your home more affordable. As a landlord, you may find yourself owning a listed building at some point. Now, there are some things that all landlords should know when it comes to owning a listed building. You will face difficulties that you will need to overcome. And here is a list of some common problems you’ll face with listed buildings, and how to solve them. Because listed buildings are old, the problem of damp becomes a real issue. Now, damp is a problem for all building. However, it can be more prominent in listed buildings. If you discover problems with damp they need to be addressed straight away otherwise you risk making them worse. And you can do this by contacting someone to get a damp survey done. There are also techniques to help you combat damp that aren’t intrusive to the building. Things like using a dehumidifier, and making sure the building is structurally sound. One of the issues involved with listed buildings is the issue of repairs. Because the buildings are old, the materials used to build them are old it can make repair work more difficult and expensive. So, the way to get round this problem is to find a company who specialise in repairing listed buildings. For instance you can find more info about roof repair for listed buildings by searching on the internet for the perfect company. This is a good way of getting important repair work done for an inexpensive price. Bear this in mind if you are the owner of listed building. What you need to remember with listed buildings is the fact that you are limited in the changes you can make. And this is going to be a problem for you if you want to make modifications to the property. A lot of landlords like to renovate a home in order to add appeal or value and secure tenancy. However, you are going to find your hands are tied a little in this regard. But, you can still make changes to many listed buildings. It will vary depending upon the building itself. You need to look at getting permission to make any changes you’d like to. Contact a solicitor or surveyor to find out the process behind applying to make changes. The big problem you’re likely to encounter is the fact that listed buildings are often much harder to sell. The issues being that people are reticent about paying for a property and not being able to make changes to it. Or, at the very least having to go through a long complex legal process to be able to make changes. Now, in order to combat this issue and try to sell the place you need to get the best out of your listed building. The great advantage of owning a listed building is that you get to own a piece of history. And this is what you need to promote to potential buyers. A lot of people will find this attractive so you need to try to push this to get people interested. You’ve got to realise that you may well encounter problems when dealing with listed buildings. And you need to figure out how to make this work for you. Sure, they look amazing, and it’s great to earn a piece of history. But, it can be a nightmare trying to sell one. This list should help to prepare you for the problems you can expect to face, and how to combat them. A carpet is a covering used on floors in homes or commercial buildings which covers your whole floor area or parts of a floor. It is made out of thick layers of fibers such as wool or polymeric materials woven together. A wall to wall carpet is first transported to a location, laid on the floor and cut to size. Once carpets are laid they are constantly in contact with air which has varying amounts of water vapor. Also, when in in use other vapors and fumes may get absorbed into your carpet. One of the goals of carpet cleaning is to get rid of the dust, odors, pet hair, food particles, stains and dirt that gets accumulated. When people and pets walk constantly tread on carpets, they accumulate dusts. With time, bacteria, viruses, allergens, and other microorganisms find their haven on carpets. A dirty or unclean carpet can cause many health issues. You, your family or your pet can get sick due to the transfer of contaminants from the carpet. The growth of microorganisms can be minimized when carpet cleaning is done intentionally and consistently. It is a good idea to have a mat at the entrance of your house. Regularly inspect it for dust. This will minimize dust from and dirt from the outside of your house to enter indoors. You can get rid of visible dust and other things like hair and food particles by a simple vacuum cleaner. Choose a vacuum that is suited for you and your household budget and need. Vacuum can range from light weighted ones to heavy ones; and low cost ones to high end ones. A vacuum will extract most of the dust particles without damaging the surface of a carpet by removing the fibrous materials. Vacuuming can be a tedious task but if you do it regularly, the effort to eliminate dust will be less. Stain removal can be a challenging task. The best method is to wash a stain immediately. Use a cloth or towel that can absorb the stain. Then wet the stained area using a recommended stain removing liquid for the time specified. When your carpet is completely dry, use the vacuum cleaner only on the stained area. To remove heavy or old stains you may need to get a professional cleaner. Keep your cleaning equipment clean and tidy after every use. After each vacuum, empty the dust collector of the vacuum cleaner and store vacuum in a safe place away from children. Before removing odors you must remove all dirt and dust as explained in the above paragraphs. Odors are caused by contamination due to the growth of microorganisms. Removing odors needs to be done very hygienically and you should take utmost care when doing so. Sometimes, you may need to lean on professional help. Certain odors can be removed by soapy solutions or readily available household chemicals such as baking soda, vinegar, or lemon juice. Make sure to dry your carpet completely after odor removing treatments. You must ensure that it is completely dry as residual liquids can trigger mold growth. Deep cleaning can become a cumbersome task. If the necessity arises however, it important to know which methods to use. Deep cleaning means to take out dirt and stains that are old and have penetrated to the inside fibers of a carpet. Ordinary vacuum cleaning and stain removing will not be sufficient for deep cleaning, as it involves multiple steps. The deep cleaning machine has to be run slowly in two directions giving enough time to extract all dirt and dust. The next step is the stain removing and odor removing phase. The chemical solution or steam is sent with hot water as the medium. There are all sorts of solutions on the market for example bleach, ammonia. Some may lean towards natural cleaners such as essential oils. The deep cleaning machine then extracts the solution after the treatment. Some machines may include drying or otherwise you must take the responsibility of drying the carpet yourself. After the deep cleaning process, you may get a fresh scent from your carpets. Be intention about cleaning your carpet. It will save you time and money in the long run. So, you’ve just spent a small fortune on a bathroom renovation – congratulations, we hope it looks great! But, it’s only half the job. Your next mission is to add those finishing touches that it would turn it from a great looking washroom to a something more luxurious. Here are some ideas for you. Although in other rooms in the home, themes can appear a little tacky, they can help pull together a bathroom. The sea is a common and popular theme, as is the beach – or even a boat. You could even decorate so that it replicates a water feature in the middle of a forest, or, go for a straight out spa. Decide on your theme, and you’ll find the rest comes easy. Whatever style you plump for, you’re going to need a mirror. They are essential to any bathroom, not just for practical reasons, but also because they make the small space appear bigger. Mirrors also reflect light, which will help keep your bathroom much brighter. Of course, you don’t have to go for a standalone mirror. If you’re short on space, then why not try a mirror fronted bathroom cabinet? Take a look here and see if anything suits – www.bellabathrooms.co.uk. When it comes to smaller bathrooms, it’s a good idea to go for these combination features as much as possible. We’ve already discussed a mirror cabinet, but there are plenty of other storage options you can consider. If you have an airing cupboard, get as much out of it as you can. It’s perfect for keeping towels warm and will save you getting an expensive rack installed. Free-standing glass corner cabinets can help you make more use of your bathroom, and they look unobtrusive. In smaller rooms, try and make as much of your vertical space as you can. Think tall and thin – and also broad. You could even set your toilet and sink areas into a large cabinet space to give you plenty of options. Floors and plants are a great look for bathrooms – and one that many people ignore. The thing is, if you go for plants that love humidity, they won’t take a huge amount of looking after. Cactus, spider plants, orchids and bamboo all like the bathroom environment. Think about artwork, too. As long as everything is sealed properly, you should have no problems with moisture getting in. Finally, look to nature. A bunch of twigs here and a beautiful piece of driftwood there are great little ornaments for any bathroom. Finally, let’s take a look at something very simple – but ultimately, highly effective. The humble wicker basket is a mainstay of many a bathroom, and for good reasons. They are lovely to look at, hide things like dirty washing, and they cost peanuts. Every home should have one! My friend is a huge fan of the reality TV show, Keeping Up with the Kardashians. She tries to tell me some of the things that the Kardashians get up to, but I don’t really want to know nor am I interested. Though I have never watched that show before, I suspect that it is not much different from reality TV shows like Big Brother and The Real Housewives of Melbourne, where there’s a little bit of amateur acting involved and a loose script to follow. Those are not the kind or reality TV shows I like. The ones I like watching in my spare time are the home improvement shows like The Block and House Rules; the variety shows like The Voice and The X Factor; cooking shows like MasterChef Australia and My Kitchen Rules; and also The Amazing Race Australia. Of the categories I listed, I would have to say that the home improvement ones are my absolute favourite. I am always amazed and impressed by how they can take a plain and drab room and transform it into a beautiful sanctuary. Realtors will tell you that the best improvement you can do to your house before selling it is to update the kitchen and bathroom. That was exactly what my friend did when he bought an old house in Mt Waverley. Over the years, he renovated and updated first his kitchen, then his bathroom. He also replaced the old windows with new ones. Though the outside of the house looked the same as when he first bought it, the renovated kitchen and bathroom gave the house a contemporary feel from the inside. As my friend had young children, he also had a cubby house with sand pit, a trampoline and a playground set in his large backyard. His children only had to step into the backyard to enjoy their very own private playground. Besides the playground equipment, my friend had some landscaping done to the backyard, such as mulched planters along the fence line with colourful native plants. My friend was ahead of the game because he did what realtors and home improvement shows are only now talking about: that buyers like a landscaped home 11.3% more than those without good landscaping, according to a report by NBC’s Today Money. Everything my friend did to this house finally paid off when he sold it for over a $1 million this year. According to Today Money, the sort of home improvements that can increase the value of a house are: 1) create a big backyard by growing low-maintenance ground covers instead of lawn, grow more trees because trees appreciate over time; 2) extending the dining/living area into the backyard by utilising the patio or deck area; 3) create a backyard sanctuary with a fountain, pond or hot tub and a comfortable sitting area; 4) an outdoor kitchen; 5) a year-round backyard with flowering shrubs because hedges can also increase the value of a property; 6) install solar-powered landscape lighting. Cover the children’s sand pit with a bird netting instead of a tarp because it lets the sunlight in to dry and sanitize the sand. If you cannot afford to hire a professional landscape designer to transform your backyard, then just pay them for the design and complete the job yourself like my friend did. Another feature that appeals to potential buyers is an irrigation system in the backyard to save on manual watering and to keep plants looking fresh. There seems to be more and more people doing their own home renovations these days. I suspect that it is because of the influence of the many home improvement shows we are bombarded with on TV every week. Though I am not by any means a handyperson, even I am inspired to try my hand at landscaping my backyard to transform it into a child’s playground. I must admit I like the idea of having my own playground in the backyard; a place where the children can just hang out when they get bored indoors or when they just want to burn some energy. I wouldn’t mind having one of those spring-free trampolines or the all-in-one cubby houses with slide, fireman pole, climbing rope, rock wall, steps and sand pit. I would also extend the living area outdoors with comfortable chairs and dining table for warmer nights, much like the ones I see on these home improvement shows. Now, that sort of transformation will definitely increase the value of my house.